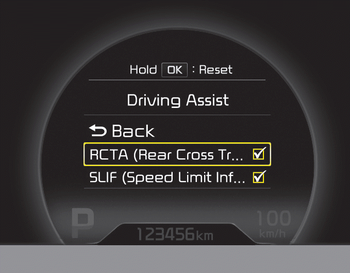 Select RCTA (Rear Cross Traffic Alert) in "User Settings" under "Driving Assist" on the instrument cluster. The system will turn on and stand by to be activated. Select RCTA again, to turn the system off. If the vehicle is turned off and on again, the RCTA system will return to the state right before the vehicle was turned off. Turn the RCTA system off when not in use. The system is operated when the vehicle speed is below 10km/h (6.2mph) with the shift lever in R (Reverse). The Rear Cross Traffic Alert (RCTA) detecting range is approximately 0.5 m ~ 20 m (1 ft ~ 65 ft). An approaching vehicle will be detected if their vehicle speed is within 4 km/h ~ 36 km/h (2.5 ~ 22.5 mph ). Note that the detecting range may vary under certain conditions. As always, use caution and pay close attention to your surroundings when backing up your vehicle.